They said you were being silly. Too picky. Too precious. Too sensitive. They didn’t understand your passion. Truth is, you were one of the visionaries. One of the few who understood that natural and organic skin care was the only answer for the future…because in one way or another, you understood the past. It’s common in our society to clean our faces with harsh sulfates, moisturize them with mineral oil and other petrolatum products (made from the oil industry), bathe in chemical fragrances and drying alcohols, and paint our nails with products that release carcinogens into the air. It’s been business as usual for decades, but it wasn’t always this way. Go back a little bit further, say, a few centuries or even a few thousand years, and you find people using things like olive oil, milk, honey, cedar oil, aloe vera, clays, salts, grapeseed oil, witch hazel, and more to exfoliate, nourish, cleanse, and moisturize skin. Some even used animal excrement in beauty treatments. Eighteenth century geishas, for example, were known for using nightingale waste to make a solution that could remove heavy white makeup while moisturizing in the process. Women in ancient Greece were also said to have used crocodile excrement in facemasks and mud soaks. Maybe their solutions weren’t all delightful-sounding, but they were all natural. That was the original organic skin care, after all! To understand how we got into the chemical/synthetic world of skin care we live in today, we have to look at a parallel industry—food and agriculture. Did you know that prior to around the 1920s, all farming was organic? Farmers didn’t have a plethora of chemical pesticides to use on their crops back then. For the most part, they used natural means to control pests and feed the soil. They struggled with insects, though, and often lost large percentages of their crops because of them. It wasn’t until the 1930s that scientists began to discover chemicals that could kill insects. The Second World War spawned a lot of research on chemicals, and it was some of that research that was later used to create things like DDT, BHC, and others. DDT was especially popular because it could kill just about any bug, and it seemed to have a low toxicity to animals. DDT worked so well that it experienced worldwide popularity, spreading like wildfire until around the 1960s when we began to discover the destructive side effects. DDT is toxic to fish, birds, and other forms of wildlife, and it accumulates in the environment and in bodily tissues. But there was no denying the increased crop production that pesticides provided, so scientists went back to the drawing board to come up with others that would, they hoped, be less dangerous to the environment and living things. Meanwhile, we were learning more and more about chemicals of all sorts, and how they could be used. In the late 1800s and early 1900s, there was an explosion in the production of chemicals, as manufacturers created new fertilizers, synthetic dyes, synthetic perfumes, solvents, plastics, and more. The petrochemical industry was churning out loads of raw materials turned into detergents, adhesives, lubricants, gels, what have you. We were enamored with what we were discovering, and businesses jumped on the bandwagon. Pesticides could increase farming output, and chemicals could be combined to create personal care products like soaps and moisturizers that were reasonably priced and seemed to work. At about the same time all this was going on, there was another movement happening, built by people who had the foresight to realize that hey, we could be making some mistakes here. It started with a group of farmers and consumers who didn’t like the direction pesticides and chemicals were taking us. They realized the potentially dangerous side effects, and wanted to keep things wholesome and healthy. In Europe, the organic movement, as we can call it now, started to gather some momentum in the 1940s. After research revealing the dangers of DDT came out in the 1960s, more people began to be concerned about the indiscriminate use of pesticides, fertilizers, and weed killers, and many started looking for more natural alternatives. A growing number of farmers adopted organic methods of growing crops, particularly as more studies came out describing not only the environmental effects of pesticides, but the health problems associated with them. People began buying food directly from organic farmers, and set up food co-ops. In 1970, the government established Earth Day, bringing more attention to the care of the environment. It was also in the 1970s that some organizations first established organic certification standards. It takes time to get the word out and increase awareness, but by the 1990s, the organic movement had spread around the world. Every day, more and more consumers demand food produced without synthetic pesticides and potentially harmful chemicals. But what about personal care products? This is where the natural skin care rebels come in to the picture, thank goodness! It started with a few scientific studies that examined chemical build-up in the body. The Centers for Disease Control and Prevention revealed that a number of chemicals in our environment, and yes, in our personal care products, were staying inside us. For things like phthalates and BHT, we were seeing “widespread” exposure. It didn’t take long to make the leap from what we were putting in our mouths to what we were putting on our skin. Used to be that humans believed the skin was a barrier and that most things couldn’t get through to the bloodstream, but studies had changed that, too. Scientists reported that under the right circumstances (involving temperature, skin condition, exposure time, and more), the skin could absorb certain things to the point where they could get inside us. Suddenly all those chemicals didn’t seem so harmless. Founded in 1993, the Environmental Working Group (EWG), who had previously told us about pesticides in our food, now revealed the extent of the potential risk in our personal care products. We began to realize that a lot of these chemicals we were slathering on ourselves every day hadn’t been tested for that type of daily use. Natural skin care rebels sounded the alarm. Why were we doing things this way? Not only were the chemicals found in most personal care products potentially dangerous and harmful to the environment, they just plain couldn’t deliver what the ancient ingredients—aloe, olive oil, honey, etc.—could, when it came to smoother, younger-looking skin. So why were we using them? The natural/organic skin care industry is booming today, as more and more people become aware of what to rebels always made perfect sense—natural and organic ingredients weren’t just the way of the past, they are the way of the future. A lot of people are still in the dark: A study by the EWG found that 12.2 million adults are exposed to known or probable human carcinogens every day through their use of personal care products, and they just don’t know it. We’re talking about things like 1,4-dioxane, formaldehyde, nitrosamines, and more. Most aren’t listed on the label, but are by-products of manufacturing. We’re exposed more than we think we are: According to that same study mentioned above, the average woman uses 12 personal care products a day, containing about 168 unique ingredients. Men use about six on average. We think a little bit won’t hurt us, which is probably true, but we don’t yet know the effects of a little bit used over and over and over again for years. So far, the Cosmetic Ingredient Review, which tests ingredients used in cosmetics, has set up studies from the point of view that humans will be exposed to just one chemical at a time, once or twice. So far, we are lacking research on long-term exposure, and even more importantly, on the effects of chemicals when they are combined. These chemicals are dangerous: Science is revealing every day the potentially dangerous side effects of many of the chemicals we are exposed to through personal care products. In addition to carcinogens, many of the innocent-looking products on our shelves contain chemicals that have been linked to developmental problems, learning delays, hormone disruption, DNA damage, asthma and other respiratory ailments, dizziness and confusion, and more. There are no universal standards: There are a number of independent certification industries for organic cosmetics, like the USDA, NATRU, and ECOCERT, but we have no universal standards for organic personal care products. Establishing them would help to clear up confusion for consumers. There is little regulation: Neither the FDA nor the USDA has any standards for labeling something “natural,” which means any manufacturer can use the term whether they have truly natural ingredients in their products or not. Nor does the FDA regulate organic cosmetics, which means that companies can use terms like “hypoallergenic,” “low sensitivity,” and “dermatologist tested” without any oversight. Natural skin care rebels, we call on you to help us spread the word. Talk about the concerns and potential dangers of every day personal care products. Express your passion for the environment. Above all, share your natural products with others. There’s no better way for people to understand than through experience, and when they discover how much better their skin responds to the solutions nature provides, you won’t have to talk anymore. 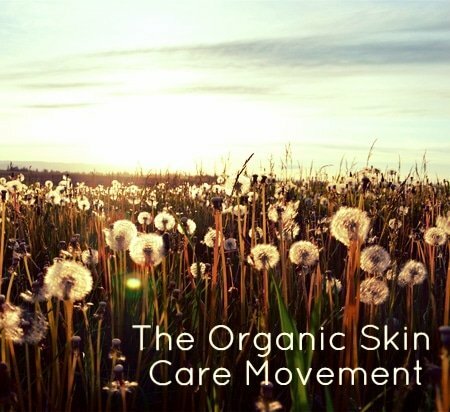 How did you first start using organic skin care? Tell us in the comments below!